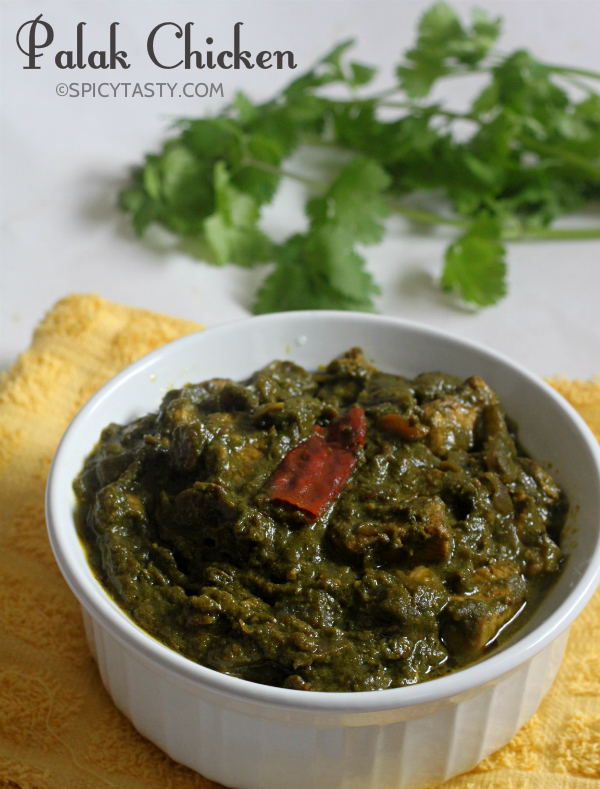 Palak Chicken is one of the most popular and delicious dishes in North Indian Cuisine. It is a wonderful blend of chicken curry and spinach. If you have a family member who dislikes spinach like my husband, try this dish and you will have a convert. 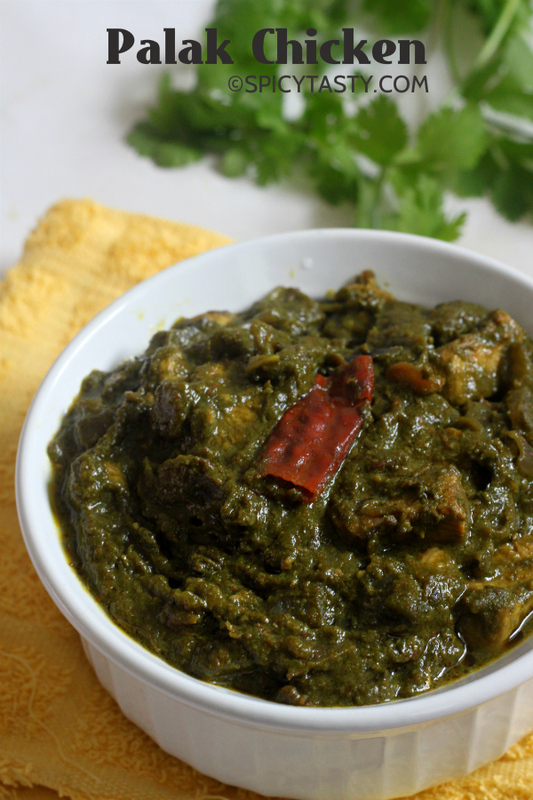 As much as the color of spinach gives away the important ingredient in this curry, my husband said he couldn’t even taste the spinach and the whole gravy tasted great. Enjoy the goodness of spinach and chicken together in one dish. Wash and drain the chicken. Then marinate it with the ingredients listed under “To Marinate”. Grind all the ingredients listed under to grind into smooth paste. Now heat oil in a wide pan and add bay leaves, fennel seeds and whole red chili after that add chopped onions and fry them till it becomes golden brown. After that add the ground paste,and fry them till the raw smell goes off. Now add the chopped tomato and fry them for 3-4 minutes in medium heat or until it becomes mushy. Now add the marinated chicken and fry them for 3-4 minutes. And add coriander powder, kasoori methi and some salt. Add 1/4 cup of water(adjust the water quantity according to the consistency you want) and close it with lid, let the mixture boil until the chicken is fully cooked and tender. In between that boil the spinach and once its cooked fully drain the water and grind them with coriander leaves into smooth paste. Once the chicken is tender add the spinach puree from above step and let it cook for 4-5 minutes in medium heat. If you want you can add 2 tbsp of cream on top and remove from heat. Serve it hot with roti or naan. Loved this receipe came out very well.this is how spinach chicken should taste like. I am from Manchester where there are MANY Indian restaurants. 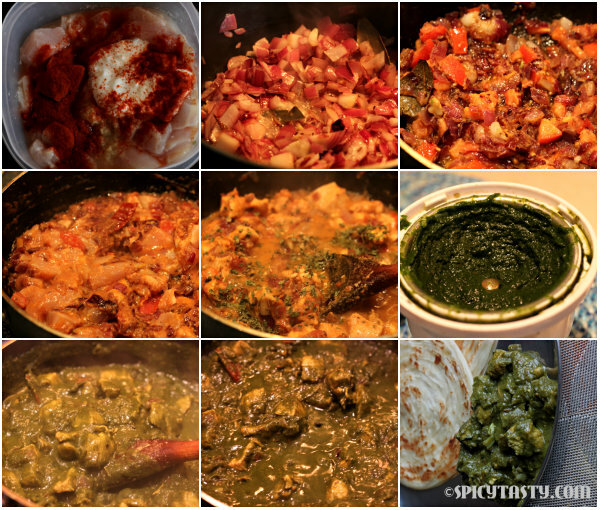 And you never see Palak chicken on the menus. I printed this off for my wife already. I can’t wait! Thanks for the recipe. this was very very good. I would like to see better measurements of the ingredients. How much is a bunch of spinach? used 3 bunches for a double recipe and it was not nearly enough. So bunches here in Mexico are different than where you are. How big is a medium onion? Cilantro here is very cheap, 2 pesos – one bunch will give you about 3 cups of leaves. How much is 1bunch of palak in grams ? its a recipe website not a weighing machine. Excellent receipe!! Came out very wel. Thanx for sharing. oh my god this is delicious! I just made it this morning for dinner tonight and I hope I don’t eat it all before dinnertime lol. 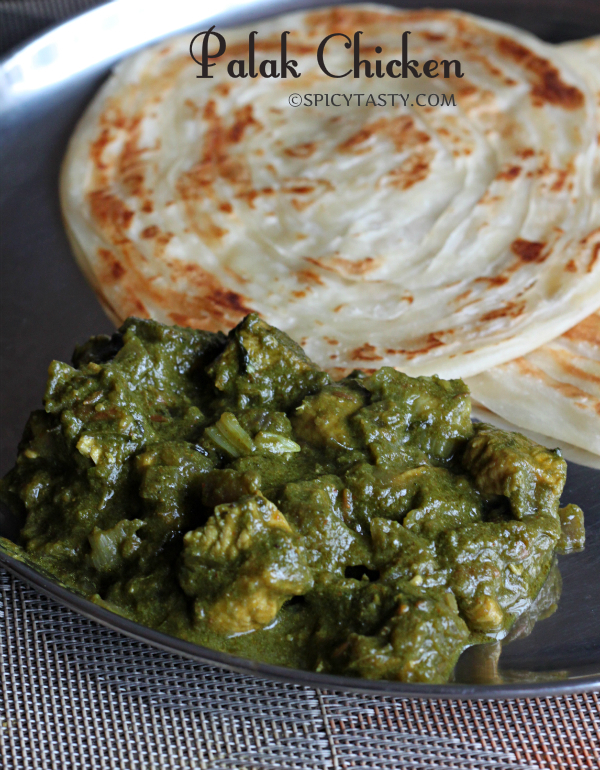 Super tasty and I like it better than the traditional palak paneer.